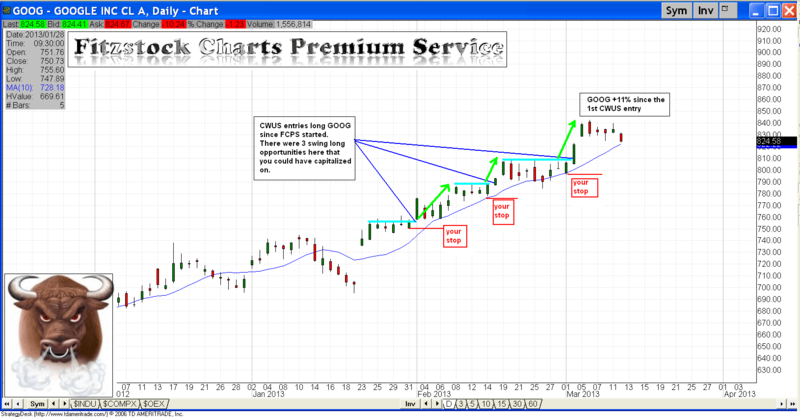 There are many different types of traders who are subscribing to Fitzstock Charts Premium Service. Some people are aggressive and looking for quick short term setups, with defined risk. Others are more conservative and want to “buy and hold” for weeks or months. I have designed the service with calculated entries and defined risk to meet the needs of all traders. 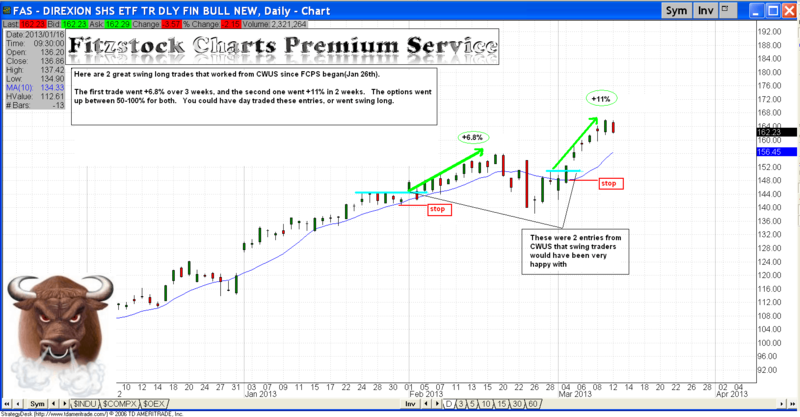 My suggested entries on CWUS and the Daily updates can be used for day trading or swing trading opportunities. Unfortunately, I can not predict the market and will not know which trades end up being great swing trades, or just day trade scalps. I do a little of both with my trading account. I like to take the quick setups and reduce my risk by scalping out of my position at +5% (1/2 my position) and +10%(another 1/4) and then let my runners(the last 1/4) run for me. Sometimes these runners get stopped out , as I raise my stops. Other times I add to my runners and they pay me even more (I did this with GOOG twice). I do this to manage my risk, and then let my winners keep rewarding me. As I have stated many times, you will have losing trades –so riding your winners is essential. My short term trading style is not for everyone. If you are taking positions swing long(or short), you will not be scaling quick and leaving runners. Swing traders try to enter a position with good risk/reward and less transactions and monitoring. This type of trading is very efficient also, but you need to have your timing right. When the markets are extended for periods of time(like we are seeing now), it is very frustrating to swing long traders who are not involved. When this happens, you need to be patient and wait. If you missed an opportunity, NEVER CHASE a stock. There will be plenty of swing opportunities over the next 10 months. Unfortunately, I will not be able to predict when the market corrects. When we see a pullback from the highs and find support at a higher moving average(50sma) you will have a better risk/reward setup to go swing long. I have attached 2 charts (FAS and GOOG) that were great swing long opportunities since FCPS started. There have been many swing and day trading opportunities over the last 6 weeks. The attached charts show the CWUS entries and your potential if you held your winning positions. If you are a swing long trader, you should trade long verse a specific level(i.e-10sma or 50sma) or a Fib % retracement (which I will post). Do not get frustrated if you missed some trades, there will be plenty of opportunities. I have said a million times, the market moves in waves. If you are a swing traders you need PATIENCE.